Did you know that the very first movie projection in history took place at a Berlin movie theater? The year was 1895, and although it is widely believed that it was the Lumière brothers who first introduced the revolution in cinema in Paris, it was Max Skladanowsky and his brother Emil who preceded their premiere by approximately two months, at the now legendary Wintergarten music hall in the capital. Shortly after, the history of cinema in Germany started writing itself slowly but surely, and the early film theorists began writing about the significance of “schaulust”, or an exciting new form of “visual pleasure” that films gave to their audience from all social classes. Of course, the enjoyment of this pleasure would not be possible without theaters, which quickly established themselves as true cultural landmarks – by 1910, there were 1000 of them operating across the country, showing both local and international moving pictures. But before we get on to discuss the remarkable cinemas that the German capital still has to offer today, let’s go back in time to that historic moment in time – when the world saw a sequence of images for the very first time, inside the Berlin movie theater of WIntergarten, as well as the events that preceded it. Born in Pankow near Berlin, Max Skladanowsky was a curious man, who grew up learning how to paint glass and to take pictures. 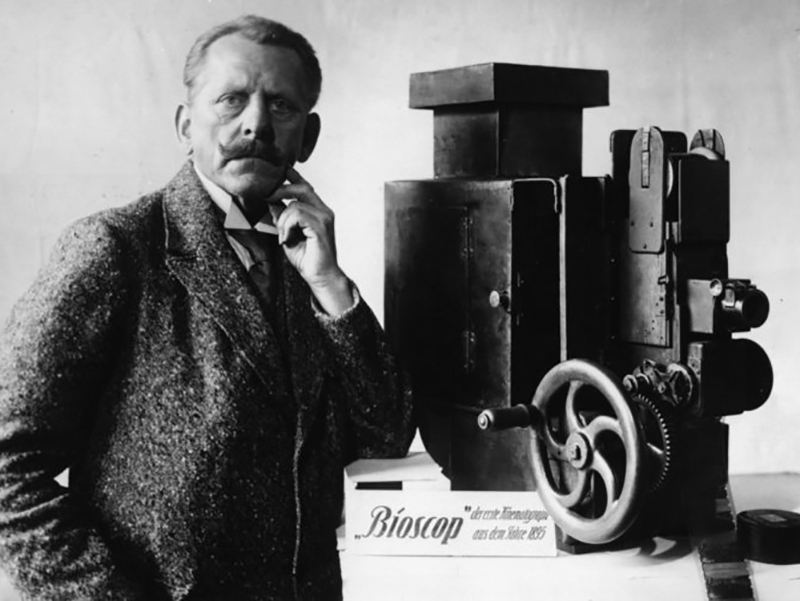 With his father Carl and brother Emil, he traveled throughout Germany and Central Europe and performed magic lantern shows, until one day he invented an actual film camera, as well as an early movie projector – the Bioscop. Inspired by the aforementioned magic-lantern technology, the Bioscop used two loops of 54mm film, projecting 16 frames per second, which was enough to create the illusion of movement. 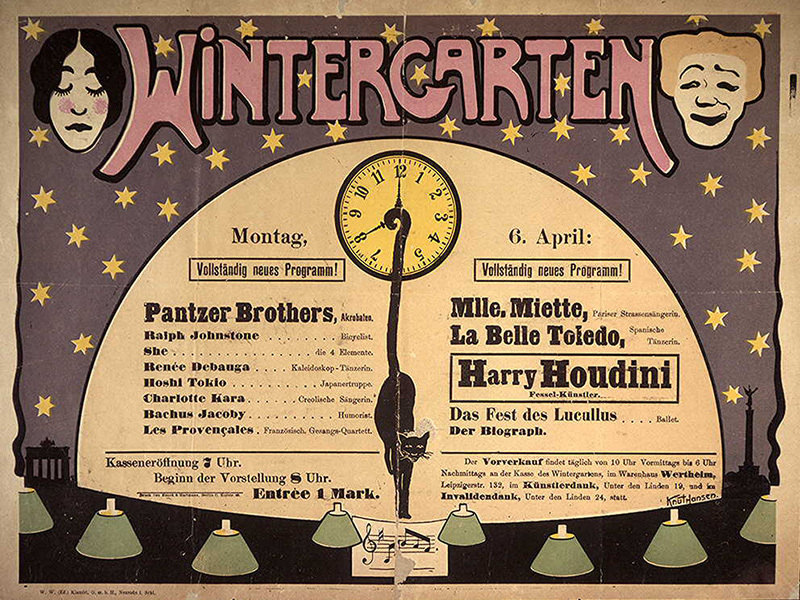 In no time, the news of an interesting new invention reached the neighboring Berlin, and Max Skladanowsky was invited (and paid) by the Wintergarten music hall to present it as the final act of a variety performance on the evening of November 1, 1895. Needless to say that it was an immediate success, as for the next four weeks, the projection of six short films, lasting only about six seconds each, filled the cinema hall to its capacity. The evening was subsequently overshadowed by the Lumière brothers and their technically superior Cinématographe show in December, yet Max Skladanowsky continued to contribute to the world of cinema with other systems like the geneva drive mechanism and some 30 films he directed between 1895 and 1905 with his brother Emil. 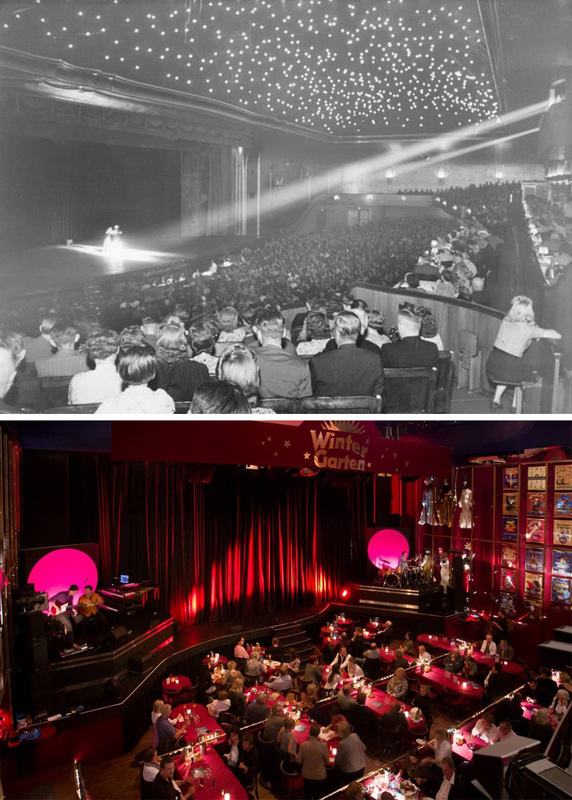 Before Max Skladanowsky brought his bioscop to what will become the first Berlin movie theater, Wintergarten was a large venue which hosted variety acts, including musical performances and sketch comedy. A conservatory of the Central Hotel in the Berlin Mitte district, it opened 1887, and its aspects were based on the model of the Wiener Theater in Austria. Over the next decade, it built a reputation of a true entertainment sanctuary, with the most splendid variety shows, as well as dancing and singing acts, taking place there on a regular basis. 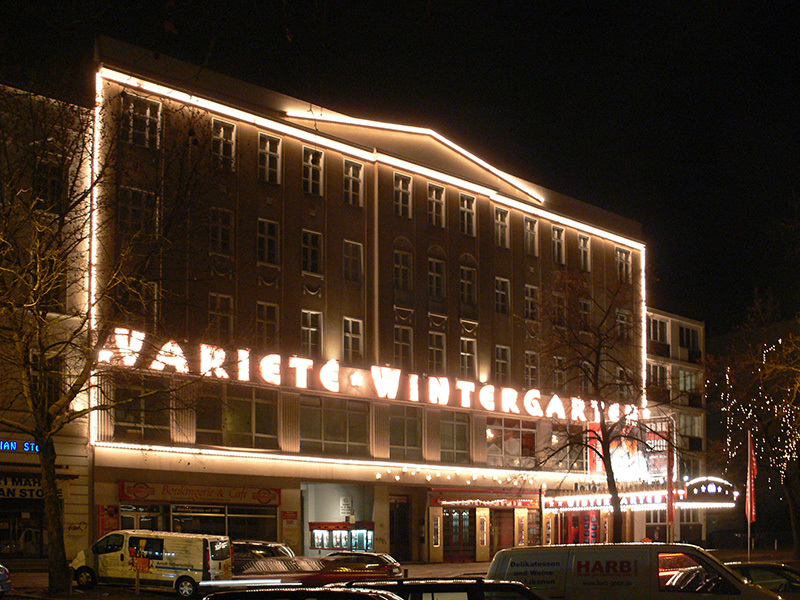 After the premiere of the abilities of the bioscop, Wintergarten carried on with its cultural program and, under the guidance of director Ludwin Schuch, this Berlin movie theater became one of the largest and most modern venues of its kind in Europe. Shortly after a performance held on June 21, 1944, Wintergarten was destroyed by a bombing attack during the World War II, alongside many other important institutions of the capital. After the war ended, there were multiple attempts to rebuilt it. In December 1945, the director of another conservatory, Ludwig Goebel, wanted to renew its former glory through projections taking place in another hall, while some 47 years later, a trio composed of Peter Schwenkow, Andre Heller and Bernhard Paul, undertook performance shows inside a space of the same name, located on Potsdamer Strasse where you can still find it today, as it provides the concept of Wintergarten with another life and revives its memory and varieté legacy. With a legacy like that, Berlin and Germany at large surely are a force to be reckoned with on the international cinematographic scene. Following the cult of the first Berlin movie theater, many cinema halls today have proven themselves to be some of the most important venues in Europe and beyond, forming a sort of a cult of film lovers and professionals as they grew and evolved. In a city as vibrant and peculiar as Berlin, movie theaters and art houses can be found in the most unpredictable places, showing everything from DDR masterpieces to latest artistic films. Some of them recently marked their 100-year anniversary, like Tilsiter Lichtspiele, which opened in 1908, or the Kino Intimes, which was founded in 1909. Today, Intimes offers some 80 seats inside a cosy 1970s interior where you can watch some of the best avant-garde films in Berlin, while Tiltsiter Lichtspiele is still a renowned art-house cinema and a conceptual art space. Another seminal venue is the Odeon Kino, that has been offering movie screenings in their original language since 1985. Specializing in short films and documentaries is ACUD, spread over six stylish floors which also house an art gallery. Carrying the title of the smallest Berlin movie theater, Lichtblick supports independent filmmaking, classical pieces and new-wave productions, available to only 32 visitors at a time. If you’re ever around Hasenheide Strasse, or Oranienplatz, make sure you also visit Sputnik and Fsk respectively, where you can watch award-winning documentaries and many other screenings definitely worth seeing.